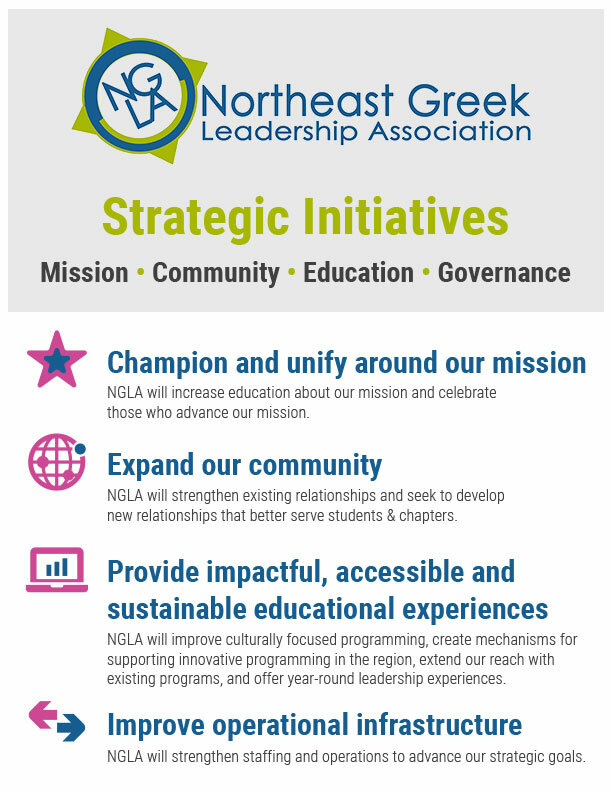 In 2011, the Northeast Greek Leadership Association embarked on a strategic planning process designed to improve the Association’s ability to better serve fraternity and sorority members in the Northeast. Through this process, the board developed a comprehensive mission. Fraternities and sororities members in the northeast can articulate their founding principles, strive to live these principles, and challenge peers whose behavior is inconsistent with these principles. NGLA is known to members on every campus as a valuable resource that provides a demonstrated return on investment. The Northeast Greek Leadership Association has a long history of service to fraternity and sorority members in the Northeast. The NGLA is a result of the merger between the Northeast Interfraternity Conference (NEIFC) and the Northeast Panhellenic Conference (NEPC). The NEIFC was created on November 15, 1982. The NEPC was created on March 1, 1984. The NEPC was created via a resolution of the National Panhellenic Conference because the Northeast was the only area of the country that did not have a regional conference for sorority women. During this meeting it was decided, by a vote of the schools in attendance, that the women hold their yearly meeting with the NEIFC. At the 2000 meeting those institutions attending the conference were asked for their consent to explore the merger of the two organizations into a new association. Merging would avoid the duplication of effort and expense created by operating as two organizations and to provide more diverse programming opportunities for all types fraternity and sorority communities in the Northeast. Consent was granted by the institutions and the NGLA was created in August of 2000.